(Korean): The 36FS is part of the USAFs 51OG at Osan Air Base, South Korea. It operates the General Dynamics F-16 Fighting Falcon aircraft conducting air superiority missions. The squadron was first activated in 1917 as the 36th Aero Squadron and served in France during World War I, although the war ended before the unit saw combat. It has been continuously active since 1930 as a fighter squadron. This is the standard 'orange version' of their squadron patch was found in a Korean embroidery shop in very limited quantities, has the "in-theater-made" feel to it, and does not come with velcro attached. (Korean): The 36FS is part of the USAFs 51OG at Osan Air Base, South Korea. It operates the General Dynamics F-16 Fighting Falcon aircraft conducting air superiority missions. The squadron was first activated in 1917 as the 36th Aero Squadron and served in France during World War I, although the war ended before the unit saw combat. It has been continuously active since 1930 as a fighter squadron. This is (what I call) their "CLOUD" patch with the squadron mascot on an White TWILL background. This patch was found in a Korean embroidery shop in very limited quantities, has the "in-theater-made" feel to it, and does not come with velcro attached. (Korean): The 36FS is part of the USAFs 51OG at Osan Air Base, South Korea. It operates the General Dynamics F-16 Fighting Falcon aircraft conducting air superiority missions. The squadron was first activated in 1917 as the 36th Aero Squadron and served in France during World War I, although the war ended before the unit saw combat. It has been continuously active since 1930 as a fighter squadron. 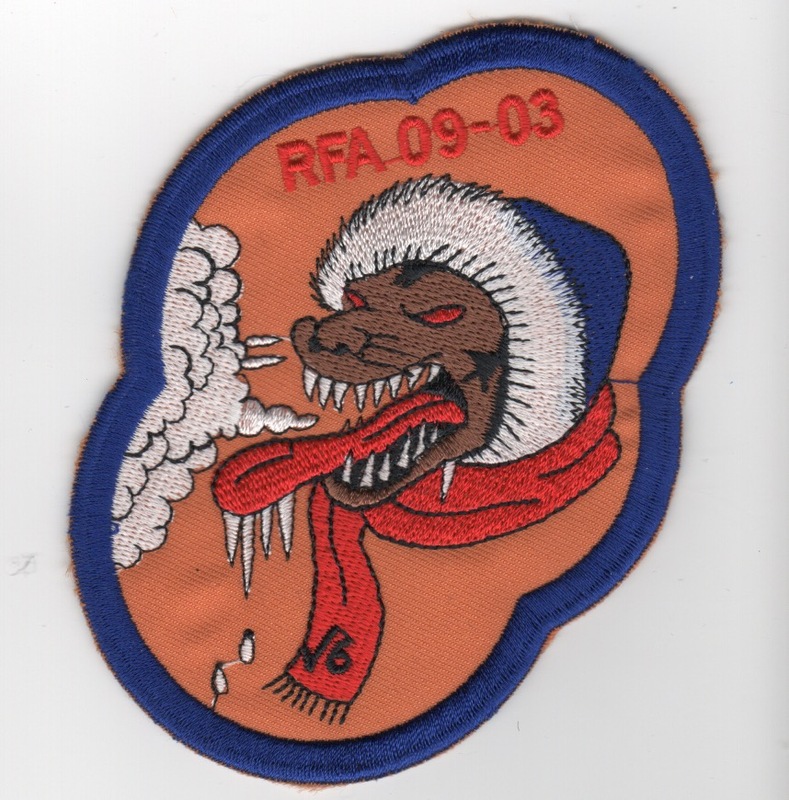 This is (what I call) their "CLOUD" patch with the squadron mascot on an orange TWILL background. This patch was found in a Korean embroidery shop in very limited quantities, has the "in-theater-made" feel to it, and does not come with velcro attached. (Korean): The 36FS is part of the USAFs 51OG at Osan Air Base, South Korea. It operates the General Dynamics F-16 Fighting Falcon aircraft conducting air superiority missions. The squadron was first activated in 1917 as the 36th Aero Squadron and served in France during World War I, although the war ended before the unit saw combat. It has been continuously active since 1930 as a fighter squadron. This is (what I call) their "CLOUD" patch with the squadron mascot on an orange SILK background. This patch was found in a Korean embroidery shop in very limited quantities, has the "in-theater-made" feel to it, and does not come with velcro attached. In Stock: ONLY THREE!! (Email me to order)!! (Korean): The 36FS is part of the USAFs 51OG at Osan Air Base, South Korea. It operates the General Dynamics F-16 Fighting Falcon aircraft conducting air superiority missions. The squadron was first activated in 1917 as the 36th Aero Squadron and served in France during World War I, although the war ended before the unit saw combat. It has been continuously active since 1930 as a fighter squadron. This is (what I call) their "CLOUD" patch with the squadron mascot on a Yellow TWILL background. This patch was found in a Korean embroidery shop in very limited quantities, has the "in-theater-made" feel to it, and does not come with velcro attached. I only have three of them, so you have to email me to order it! (Korean): The 36FS is part of the USAFs 51OG at Osan Air Base, South Korea. It operates the General Dynamics F-16 Fighting Falcon aircraft conducting air superiority missions. The squadron was first activated in 1917 as the 36th Aero Squadron and served in France during World War I, although the war ended before the unit saw combat. It has been continuously active since 1930 as a fighter squadron. This is (what I call) their "CLOUD" patch with the squadron mascot on a Yellow SILK background. This patch was found in a Korean embroidery shop in very limited quantities, has the "in-theater-made" feel to it, and does not come with velcro attached. (Korean): The 36FS is part of the USAFs 51OG at Osan Air Base, South Korea. It operates the General Dynamics F-16 Fighting Falcon aircraft conducting air superiority missions. The squadron was first activated in 1917 as the 36th Aero Squadron and served in France during World War I, although the war ended before the unit saw combat. It has been continuously active since 1930 as a fighter squadron. 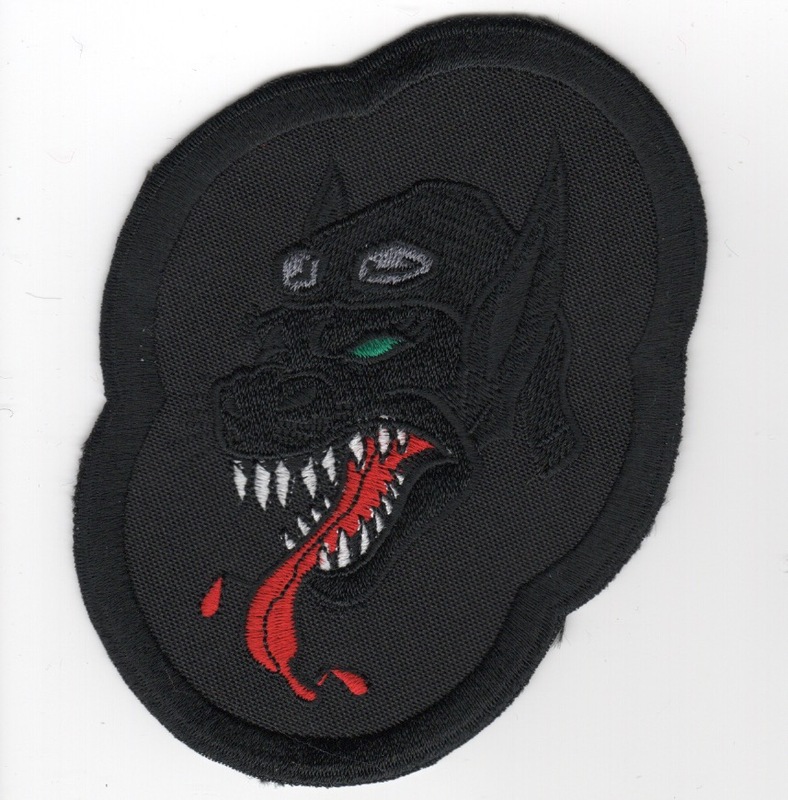 This is (what I call) their "CLOUD" patch with the squadron mascot on a black TWILL background. This patch was found in a Korean embroidery shop in very limited quantities, has the "in-theater-made" feel to it, and does not come with velcro attached. (Korean): The 36FS is part of the USAFs 51OG at Osan Air Base, South Korea. It operates the General Dynamics F-16 Fighting Falcon aircraft conducting air superiority missions. The squadron was first activated in 1917 as the 36th Aero Squadron and served in France during World War I, although the war ended before the unit saw combat. It has been continuously active since 1930 as a fighter squadron. 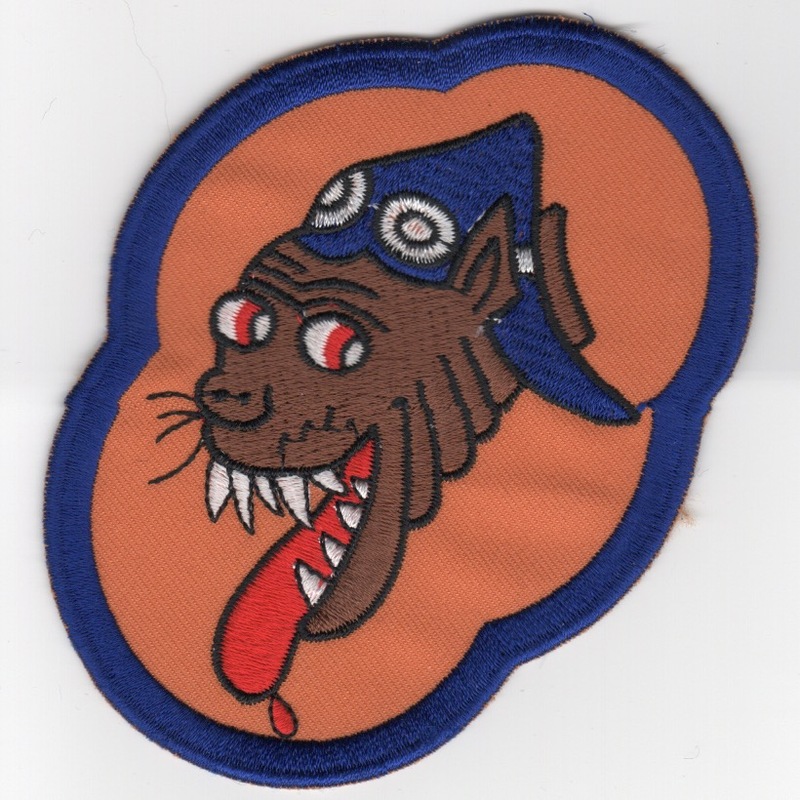 This is (what I call) their "CLOUD" patch with the squadron mascot on an orange TWILL background. 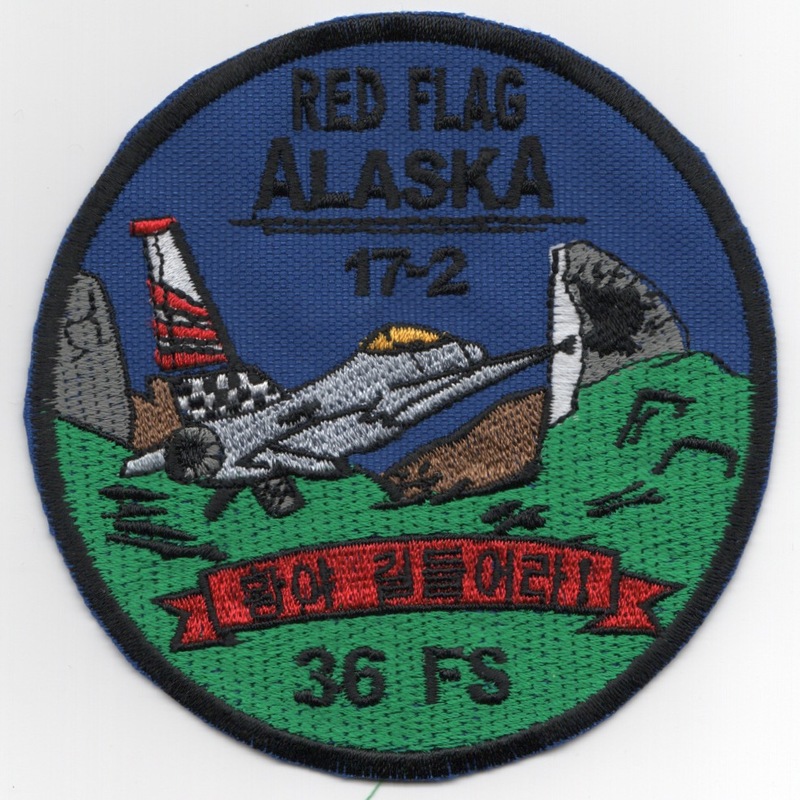 This patch was created for their participation in the Red Flag/Alaska (RFA) 09-03 and is a very highly sought after patch. It was found in a Korean embroidery shop in very limited quantities, has the "in-theater-made" feel to it, and does not come with velcro attached. (Korean): The 36FS is part of the USAFs 51OG at Osan Air Base, South Korea. It operates the General Dynamics F-16 Fighting Falcon aircraft conducting air superiority missions. The squadron was first activated in 1917 as the 36th Aero Squadron and served in France during World War I, although the war ended before the unit saw combat. It has been continuously active since 1930 as a fighter squadron. 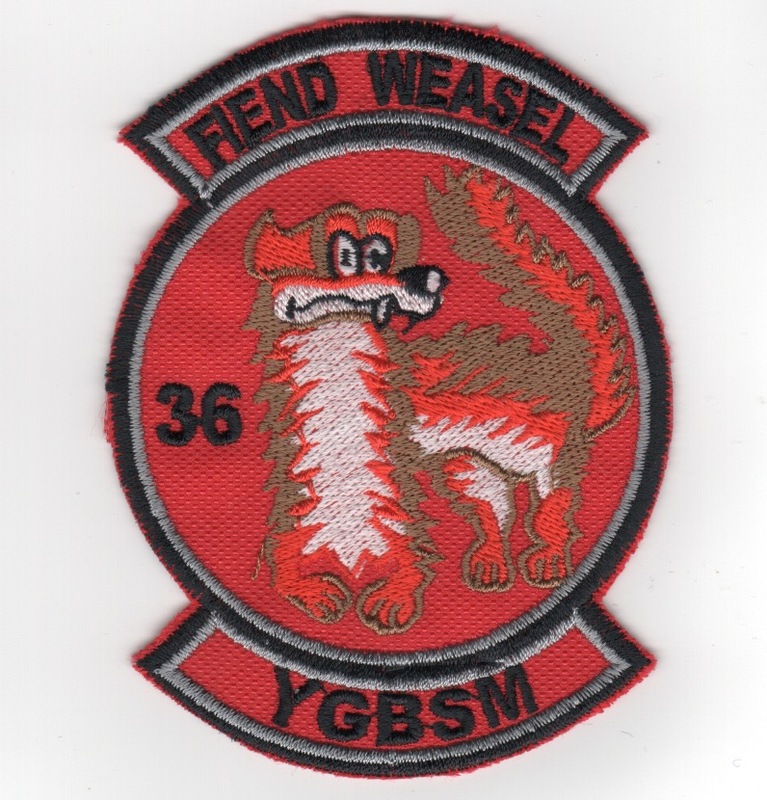 This is their 'FIEND WEASEL' patch and says 'YGBSM' along the bottom on an orange TWILL background. This patch was found in a Korean embroidery shop in very limited quantities, has the "in-theater-made" feel to it, and does not come with velcro attached. (Korean): The 36FS is part of the USAFs 51OG at Osan Air Base, South Korea. It operates the General Dynamics F-16 Fighting Falcon aircraft conducting air superiority missions. The squadron was first activated in 1917 as the 36th Aero Squadron and served in France during World War I, although the war ended before the unit saw combat. It has been continuously active since 1930 as a fighter squadron. 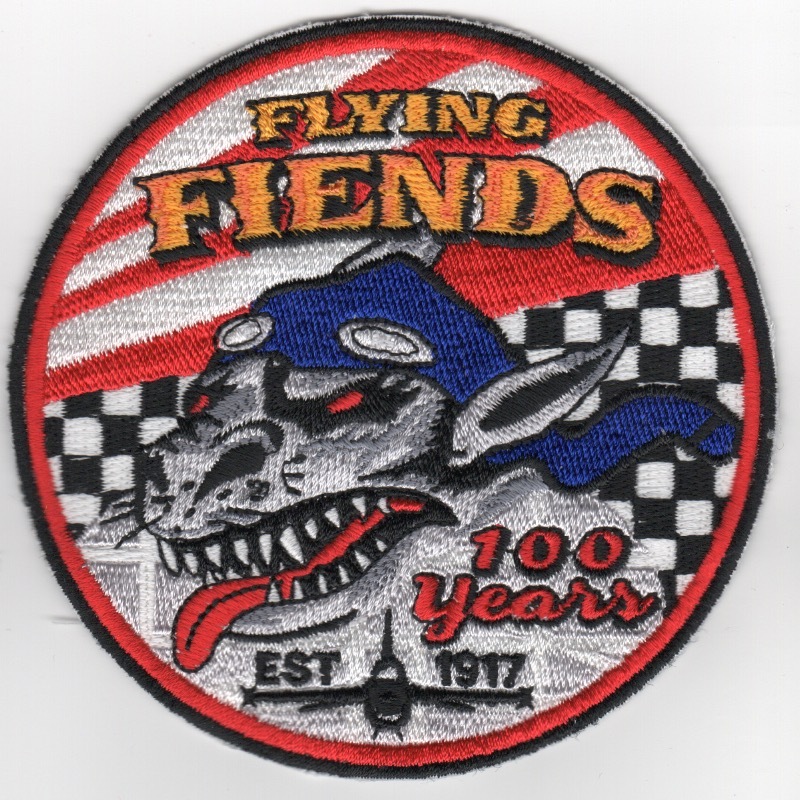 This is their '100th Anniversary' patch and says 'FLYING FIENDS' across the top with the 'gray' mascot (center) and the F-16 front view and says "EST 1917" (bottom). This patch was found in a Korean embroidery shop in very limited quantities, has the "in-theater-made" feel to it, and does not come with velcro attached. (Korean): The 36FS is part of the USAFs 51OG at Osan Air Base, South Korea. It operates the General Dynamics F-16 Fighting Falcon aircraft conducting air superiority missions. The squadron was first activated in 1917 as the 36th Aero Squadron and served in France during World War I, although the war ended before the unit saw combat. It has been continuously active since 1930 as a fighter squadron. 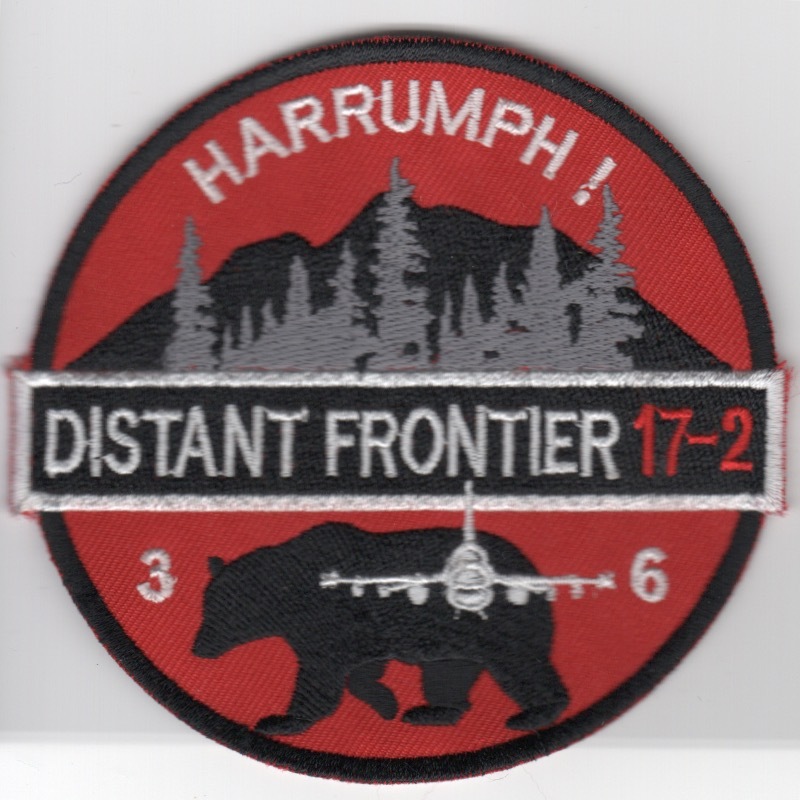 This is the patch created for "Distant Frontier 17-2" exercise, which is a unit-level training iteration designed to sharpen participants' tactical combat skills and develop interoperable plans and programs across the joint force. This patch was found in a Korean embroidery shop in very limited quantities, has the "in-theater-made" feel to it, and does not come with velcro attached. (Korean): The 36FS is part of the USAFs 51OG at Osan Air Base, South Korea. It operates the General Dynamics F-16 Fighting Falcon aircraft conducting air superiority missions. The squadron was first activated in 1917 as the 36th Aero Squadron and served in France during World War I, although the war ended before the unit saw combat. It has been continuously active since 1930 as a fighter squadron. 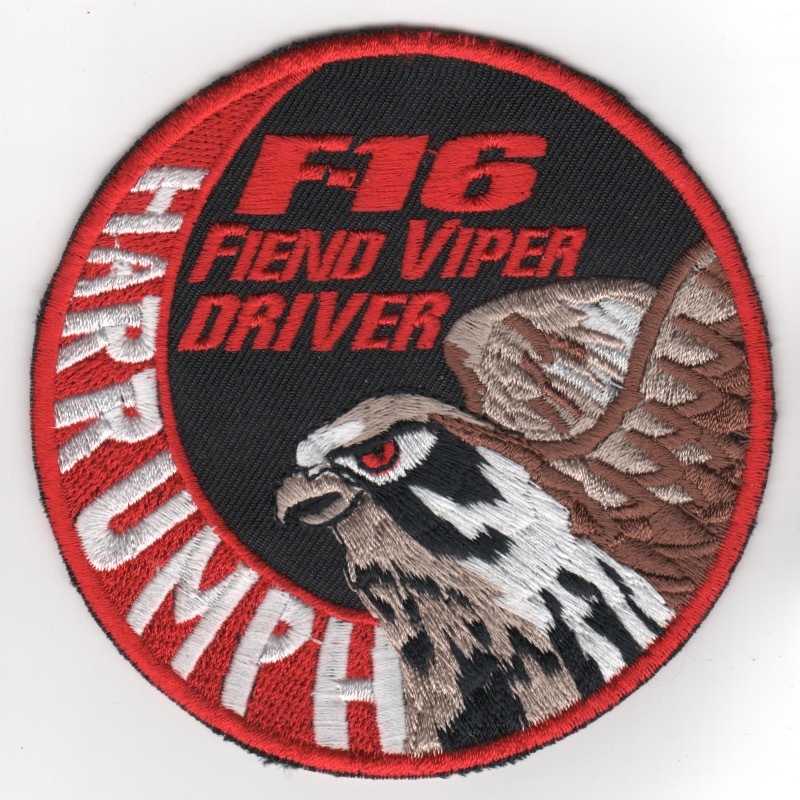 This is their "HARRUMPH SWIRL" patch that says "F-16 FIEND VIPER DRIVER". This patch was found in a Korean embroidery shop in VERY limited quantities, has the "in-theater-made" feel to it, and does not come with velcro attached. With only FOUR, you have to email me to order it. (Korean): The 36FS is part of the USAFs 51OG at Osan Air Base, South Korea. It operates the General Dynamics F-16 Fighting Falcon aircraft conducting air superiority missions. The squadron was first activated in 1917 as the 36th Aero Squadron and served in France during World War I, although the war ended before the unit saw combat. It has been continuously active since 1930 as a fighter squadron. This is their rendition of the ACC MAJCOM crest patch with their colors instead. This patch was found in a Korean embroidery shop in very limited quantities, has the "in-theater-made" feel to it, and does not come with velcro attached. (Korean): The 36FS is part of the USAFs 51OG at Osan Air Base, South Korea. It operates the General Dynamics F-16 Fighting Falcon aircraft conducting air superiority missions. The squadron was first activated in 1917 as the 36th Aero Squadron and served in France during World War I, although the war ended before the unit saw combat. It has been continuously active since 1930 as a fighter squadron. 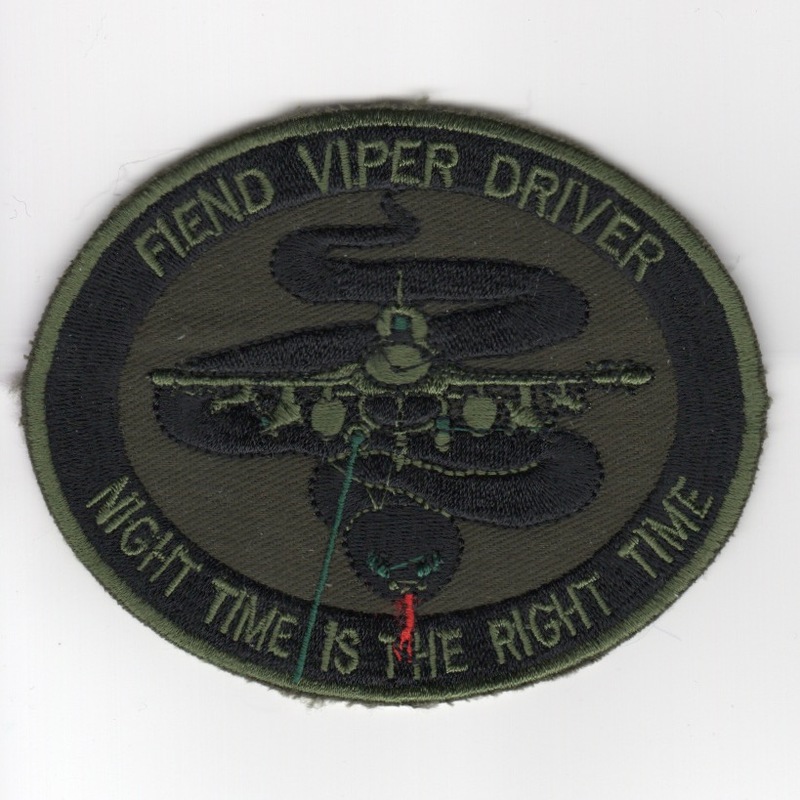 This patch says "FIEND VIPER DRIVER" (top) and "NIGHT TIME IS THE RIGHT TIME" (bottom) and comes in the new OCP colors. This patch was found in a Korean embroidery shop in very limited quantities, has the "in-theater-made" feel to it, and does not come with velcro attached. In Stock: ONLY SIX! (Email me to make sure it is in stock)!! 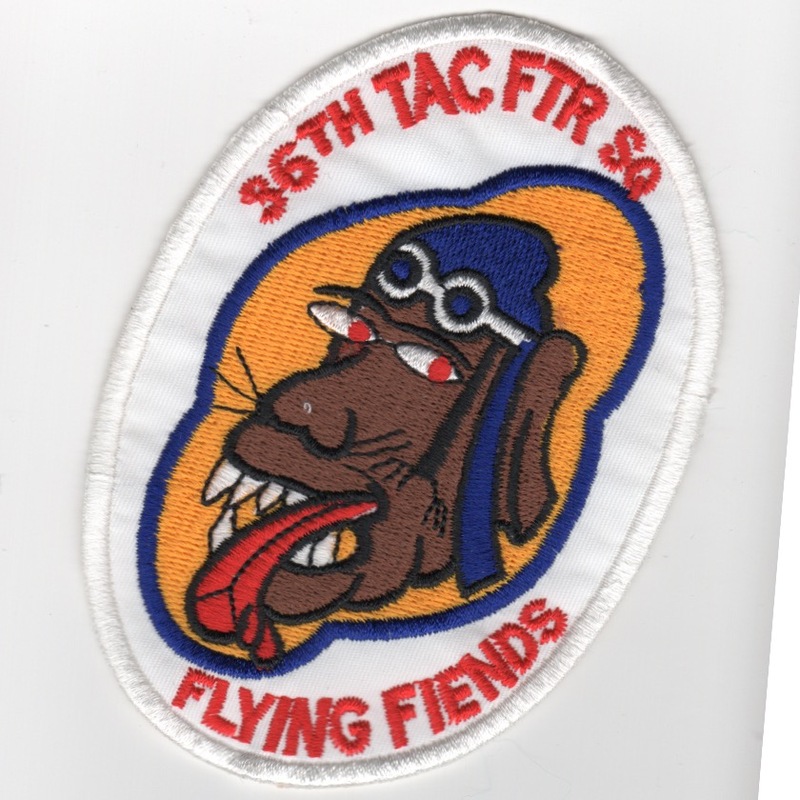 (Korean): The 36FS is part of the USAFs 51OG at Osan Air Base, South Korea. It operates the General Dynamics F-16 Fighting Falcon aircraft conducting air superiority missions. The squadron was first activated in 1917 as the 36th Aero Squadron and served in France during World War I, although the war ended before the unit saw combat. It has been continuously active since 1930 as a fighter squadron. 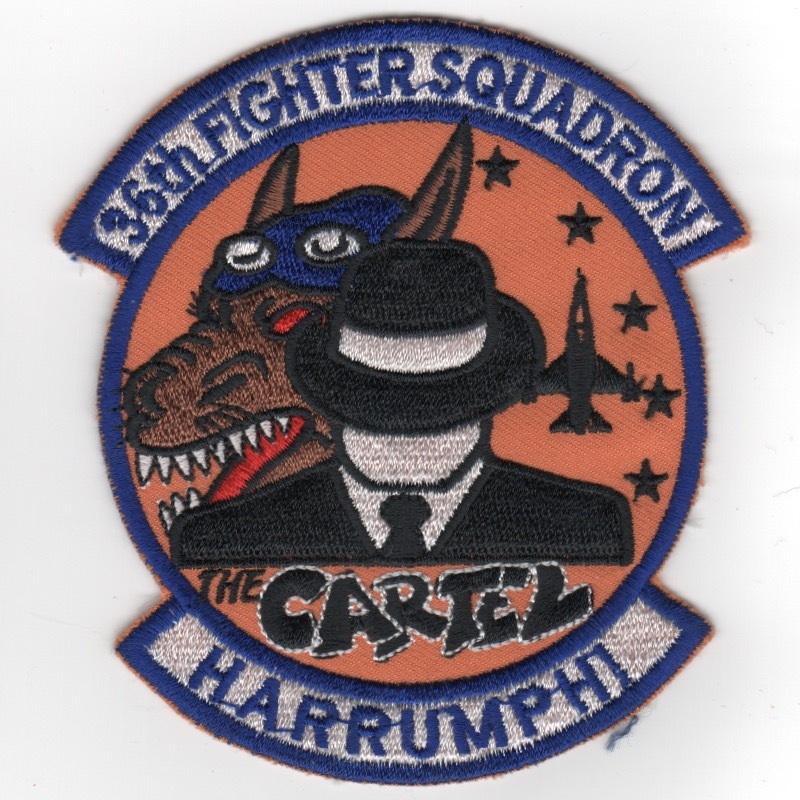 This patch says "THE CARTEL" and "HARRUMPH" (along the bottom). This patch was found in a Korean embroidery shop in very limited quantities, has the "in-theater-made" feel to it, and does not come with velcro attached. In Stock: ONLY FIVE! (Email me to make sure it is in stock)!! (Korean): The 36FS is part of the USAFs 51OG at Osan Air Base, South Korea. It operates the General Dynamics F-16 Fighting Falcon aircraft conducting air superiority missions. The squadron was first activated in 1917 as the 36th Aero Squadron and served in France during World War I, although the war ended before the unit saw combat. It has been continuously active since 1930 as a fighter squadron. 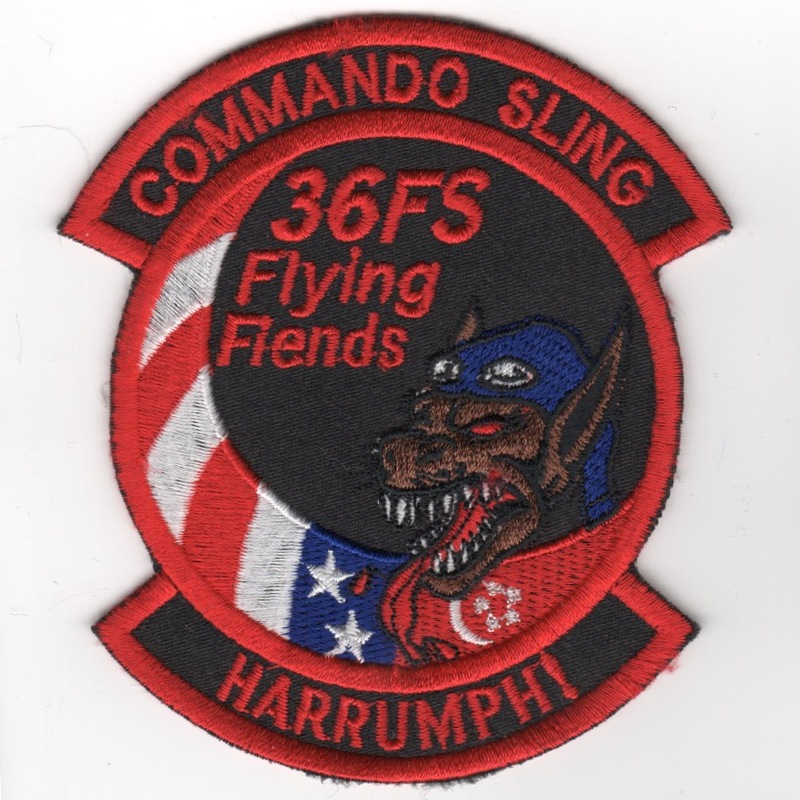 This patch says "COMMANDO SLING" (top) and "HARRUMPH" (bottom). This patch was found in a Korean embroidery shop in very limited quantities, has the "in-theater-made" feel to it, and does not come with velcro attached. In Stock: ONLY FOUR! (Email me to ORDER)!! 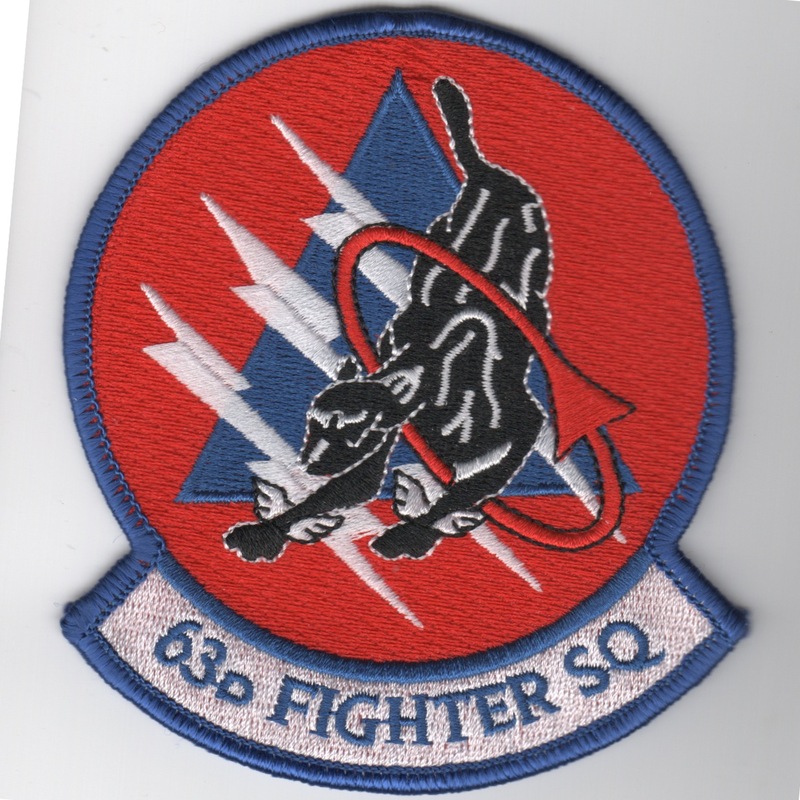 (Korean): The 36FS is part of the USAFs 51OG at Osan Air Base, South Korea. It operates the General Dynamics F-16 Fighting Falcon aircraft conducting air superiority missions. The squadron was first activated in 1917 as the 36th Aero Squadron and served in France during World War I, although the war ended before the unit saw combat. It has been continuously active since 1930 as a fighter squadron. 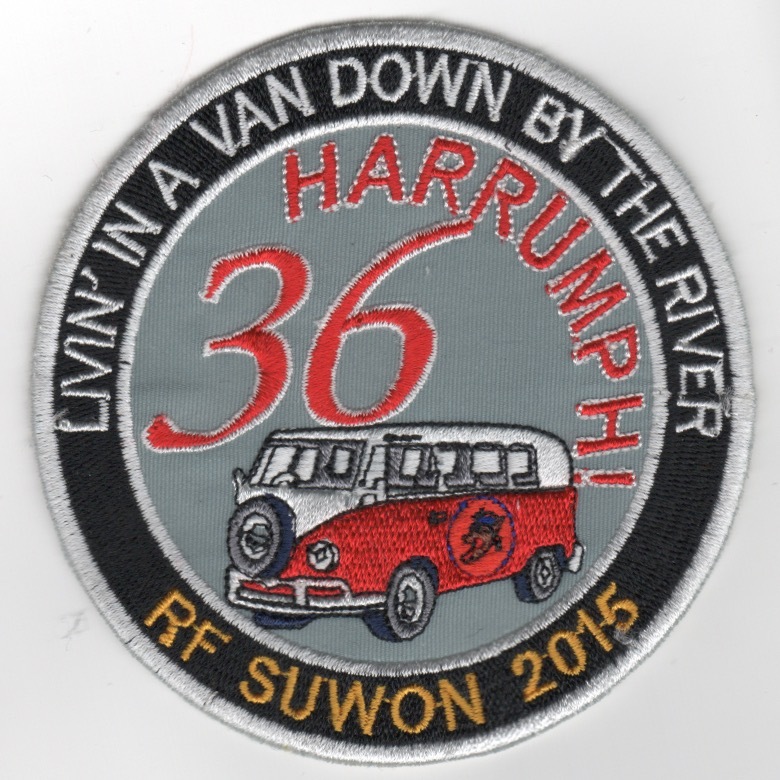 This patch says "LIVIN IN A VAN DOWN BY THE RIVER" (Top) and "RF SUWON 2015" (bottom) and was created for their participation in "Red Flag SUWON" in 2015. This patch was found in a Korean embroidery shop in very limited quantities, has the "in-theater-made" feel to it, and does not come with velcro attached. With only FOUR, email me to order one!! 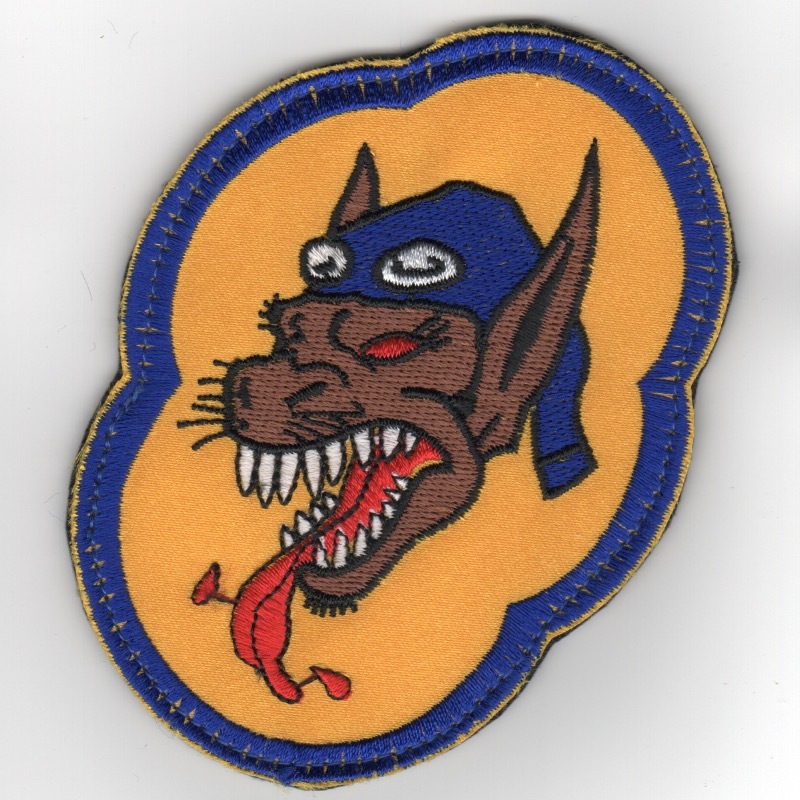 This is the color version of the squadron patch for the 55th Fighter Squadron stationed at Shaw AFB, SC. As you can see, it only has the one "tab" on the 5's and does not come with velcro attached. This is the color version of the squadron patch for the 55th Fighter Squadron stationed at Shaw AFB, SC. As you can see, it only has the one "tab" on the 5's and does come with velcro attached. 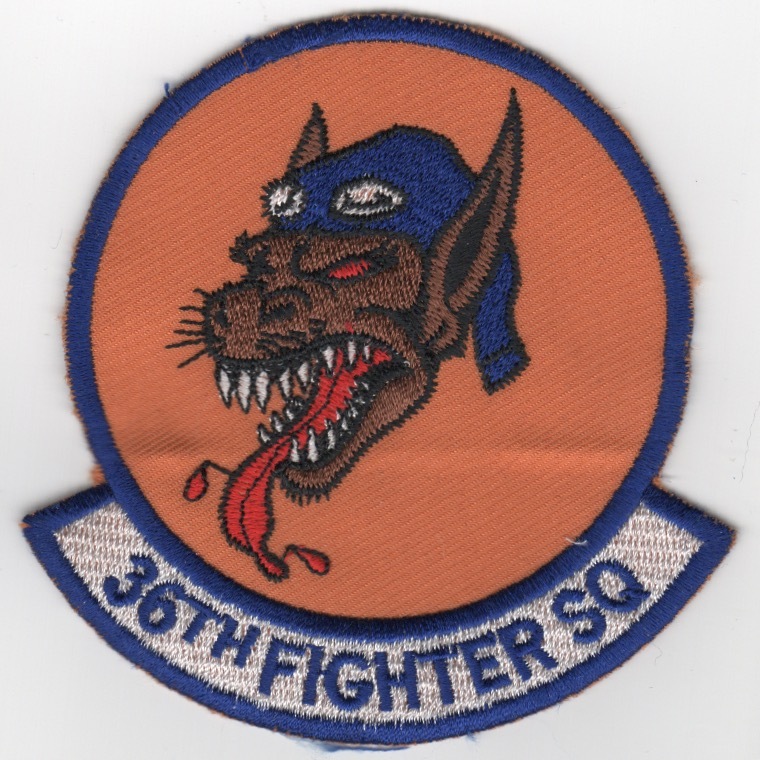 This is the subdued version of the squadron patch for the 55th Fighter Squadron stationed at Shaw AFB, SC. As you can see, it only has the one "tab" on the 5's and does not come with velcro attached. This is the color version of the squadron patch for the 55th Fighter Squadron stationed at Shaw AFB, SC that has the three "tabs" on the 5's. This patch does not come with velcro attached. 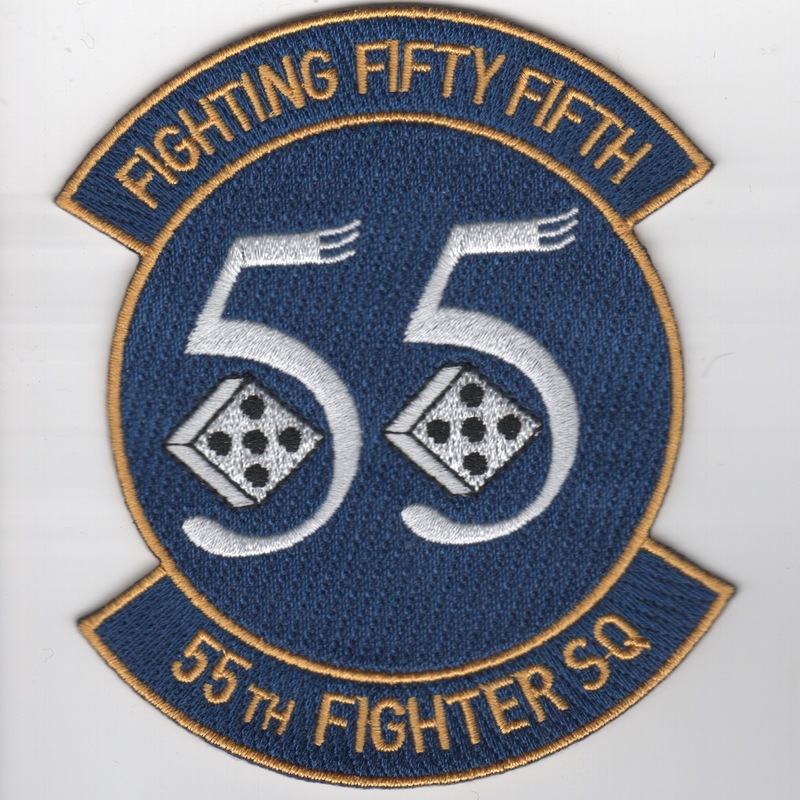 The 55th Fighter Squadron (55 FS) is part of the 20th Fighter Wing at Shaw Air Force Base, South Carolina and operates the F-16 Fighting Falcon aircraft conducting air superiority missions. 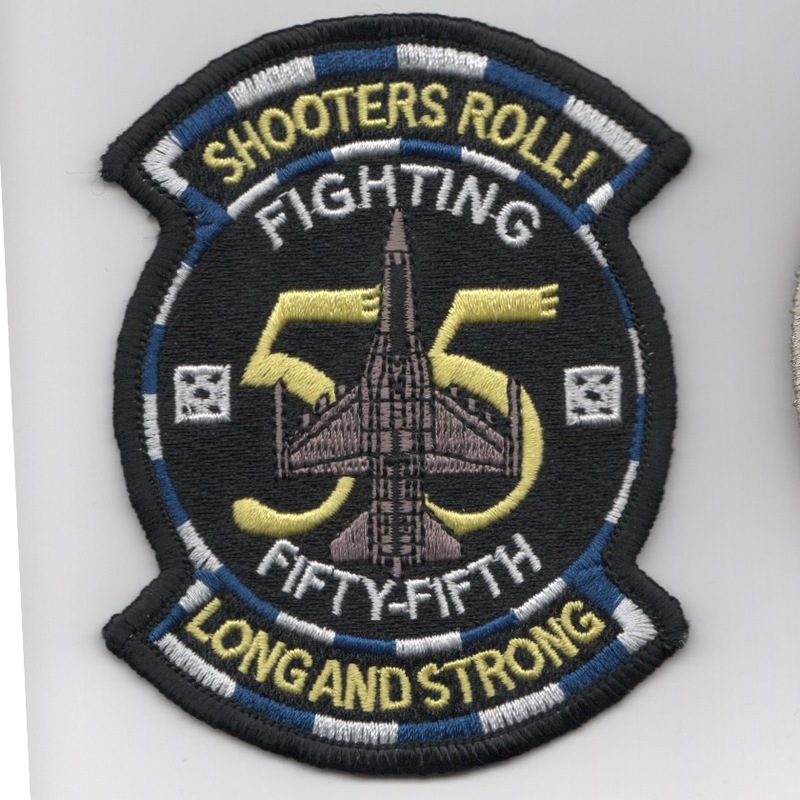 This patch says "SHOOTERS ROLL" (across the top) and "LONG AND STRONG" (along the bottom) and does come with velcro. 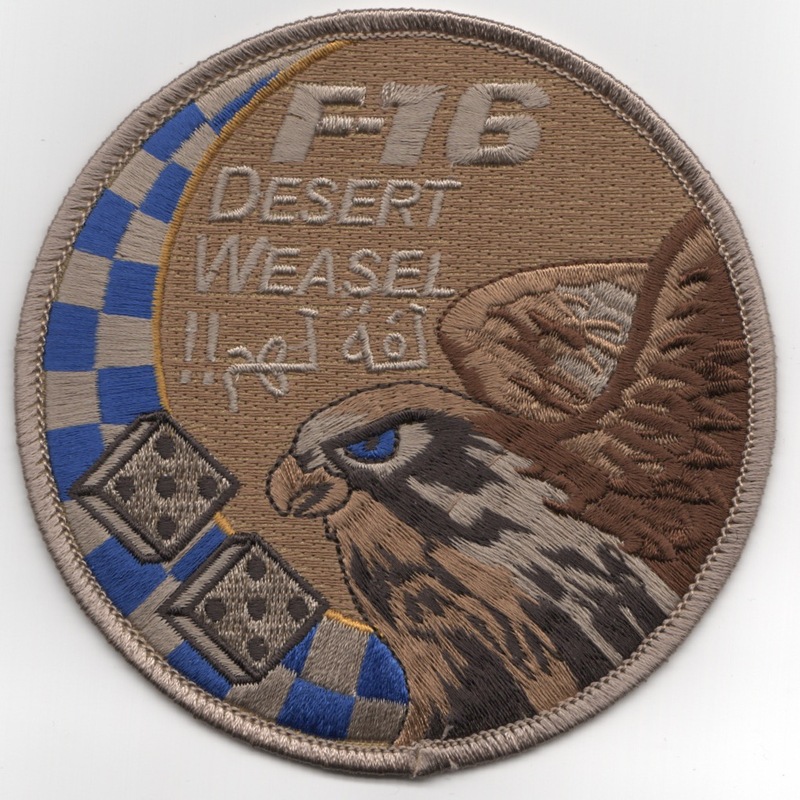 This is the desert version of the 55th Expeditionary Fighting Squadron's "Desert Weasel" patch depicting the planform of the F-16 on it. This patch DOES NOT come with velcro attached. 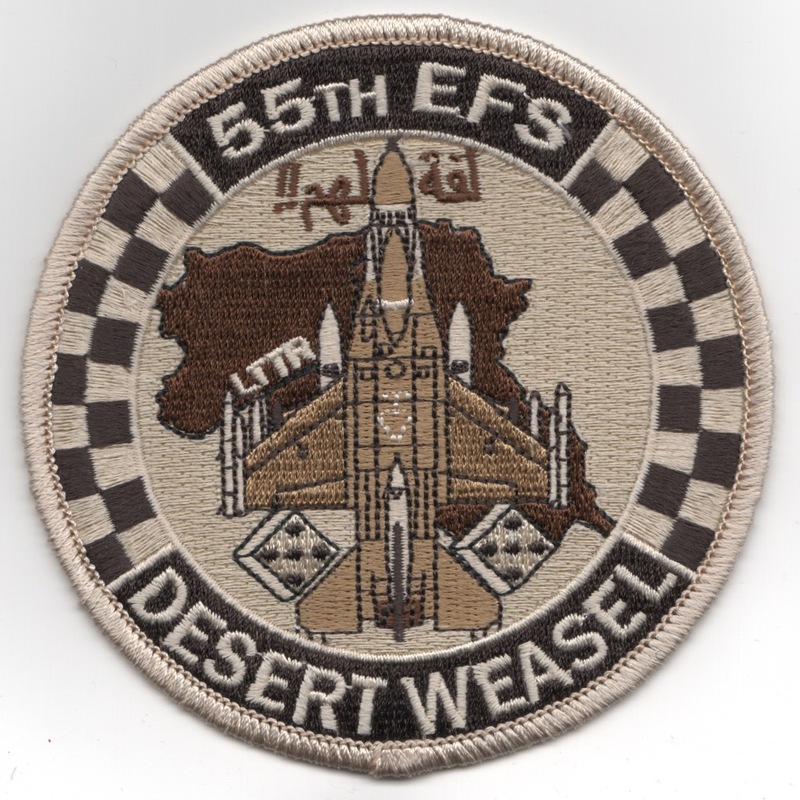 This is the desert version of the 55th Expeditionary Fighting Squadron's "Desert Weasel" patch depicting the head of the Falcon on it. This patch DOES NOT come with velcro attached. This is the historical reproduction Friday patch for the 62nd Fighter Squadron that flies the Viper out of Luke AFB, AZ. This is the leather version of the current Friday patch for the 62nd Fighter Squadron that flies the Viper out of Luke AFB, AZ. This is the current version of the squadron patch for the 63rd Fighter Squadron that flies the Viper out of Luke AFB, AZ. This patch does not come with velcro attached. This is the current version of the triangular squadron patch for the 63rd Fighter Squadron that flies the Viper out of Luke AFB, AZ. This is the "FCF FLight Test" patch for the 71st Operations Group. Like you all know, my forte' is US Naval Aviation, so if you know what aircraft these guys fly and more info, let me know and I'll post it. 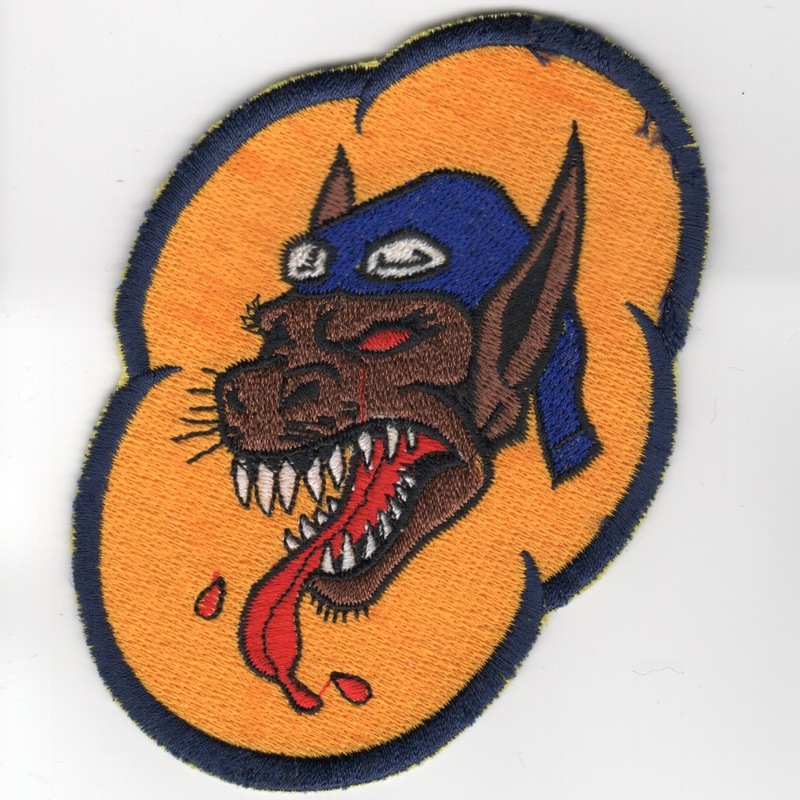 This is the color version of the squadron patch for the 77th Fighter Squadron stationed at Shaw AFB, SC. The 77th Fighter Squadron (77 FS) is part of the 20th Fighter Wing at Shaw Air Force Base, SC. It operates the F-16 Fighting Falcon aircraft conducting air superiority missions. The squadron is one of the oldest in the United States Air Force, its origins dating to 20 February 1918, being organized at Rich Field, Waco Texas, as a pilot training Squadron during World War I. The squadron saw combat during World War II, and became part of the United States Air Forces in Europe (USAFE) during the Cold War. This patch DOES NOT come with velcro attached. This is the desert version of the squadron patch for the 77th Fighter Squadron stationed at Shaw AFB, SC. The 77th Fighter Squadron (77 FS) is part of the 20th Fighter Wing at Shaw Air Force Base, SC. It operates the F-16 Fighting Falcon aircraft conducting air superiority missions. The squadron is one of the oldest in the United States Air Force, its origins dating to 20 February 1918, being organized at Rich Field, Waco Texas, as a pilot training Squadron during World War I. The squadron saw combat during World War II, and became part of the United States Air Forces in Europe (USAFE) during the Cold War. This patch DOES NOT come with velcro attached. 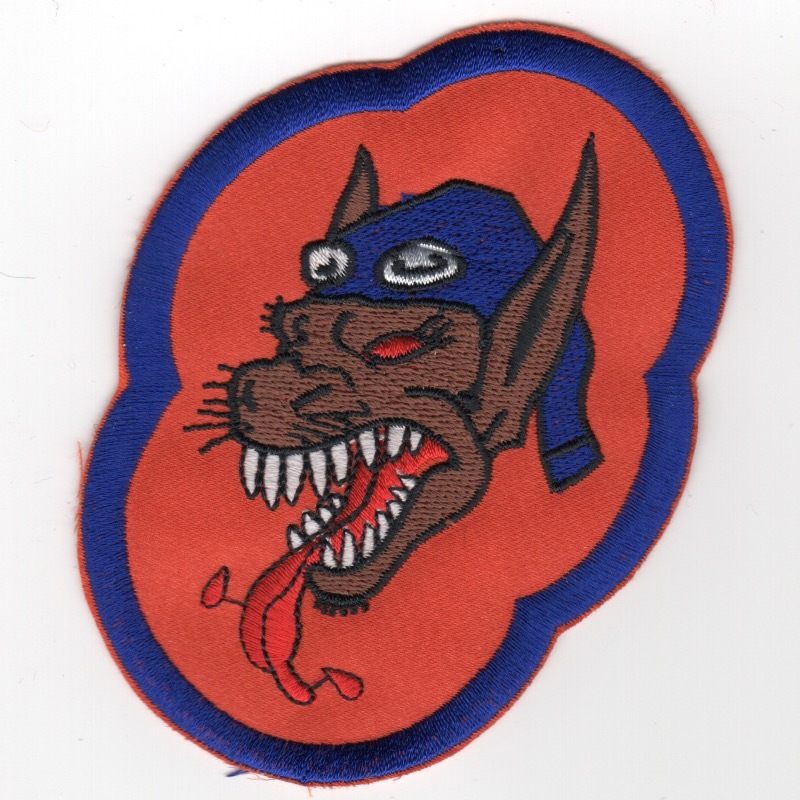 This is the subdued version of the squadron patch for the 77th Fighter Squadron stationed at Shaw AFB, SC. This patch DOES NOT come with velcro attached. This is the desert version of the "All Aces" patch for the 77th Fighter Squadron stationed at Shaw AFB, SC. You can read about their history above. This patch DOES NOT come with velcro attached. This is the desert version of the "STAR" patch for the 77th Fighter Squadron stationed at Shaw AFB, SC. You can read about their history above. This patch DOES NOT come with velcro attached. This is the red/white version of the "shield" patch that says "Dealers of Death" on it. 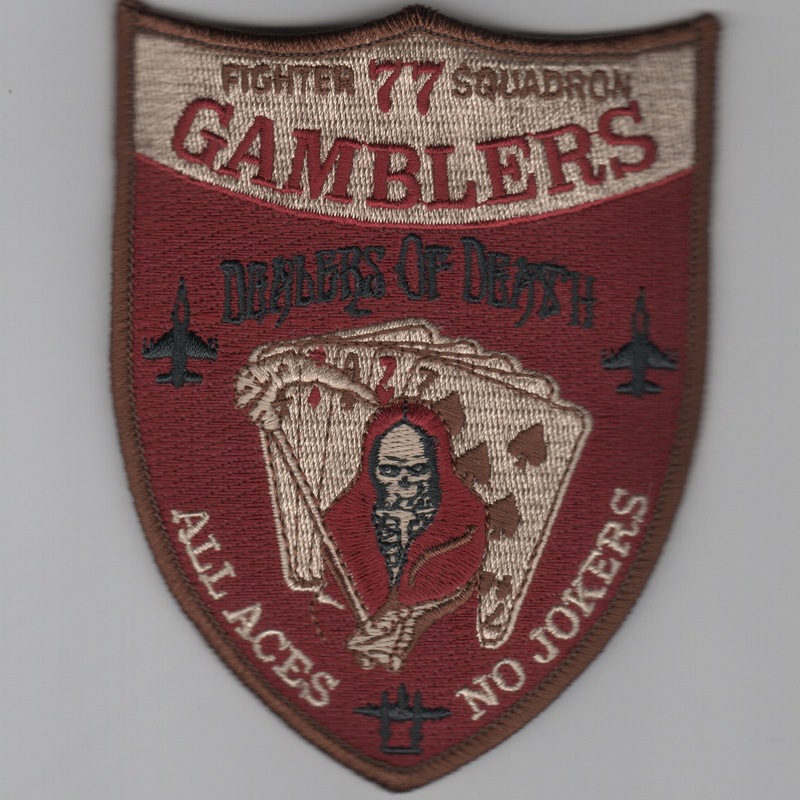 Their Squadron "Callsign" is "Gamblers" and shows the Grim Reaper on a hand of cards. You can read about their history above. This patch DOES NOT come with velcro attached. This is the desert version of the "shield" patch that says "Dealers of Death" on it. 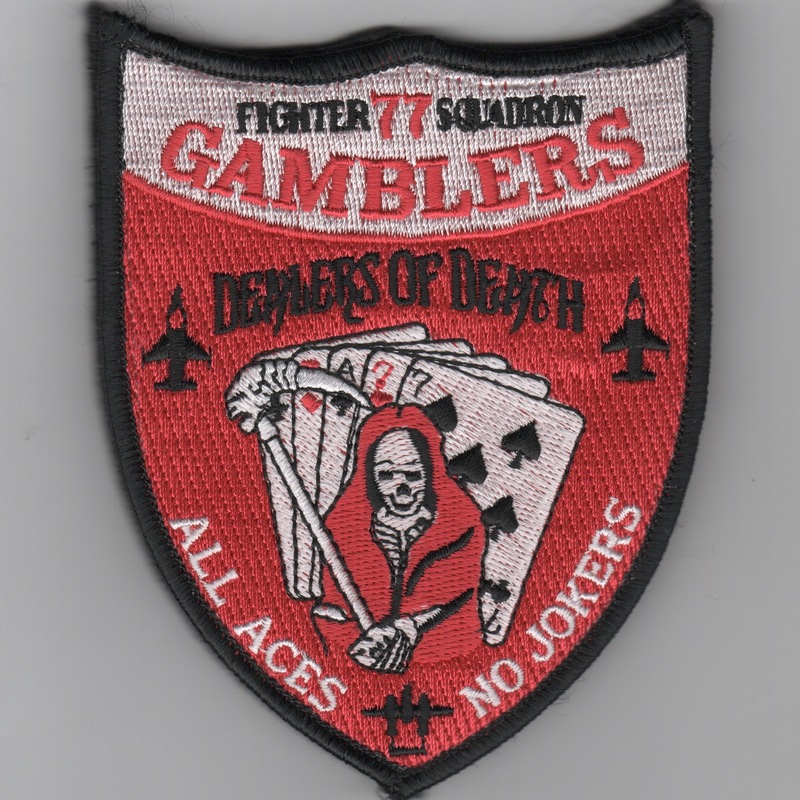 Their Squadron "Callsign" is "Gamblers" and shows the Grim Reaper on a hand of cards. You can read about their history above. This patch DOES NOT come with velcro attached. 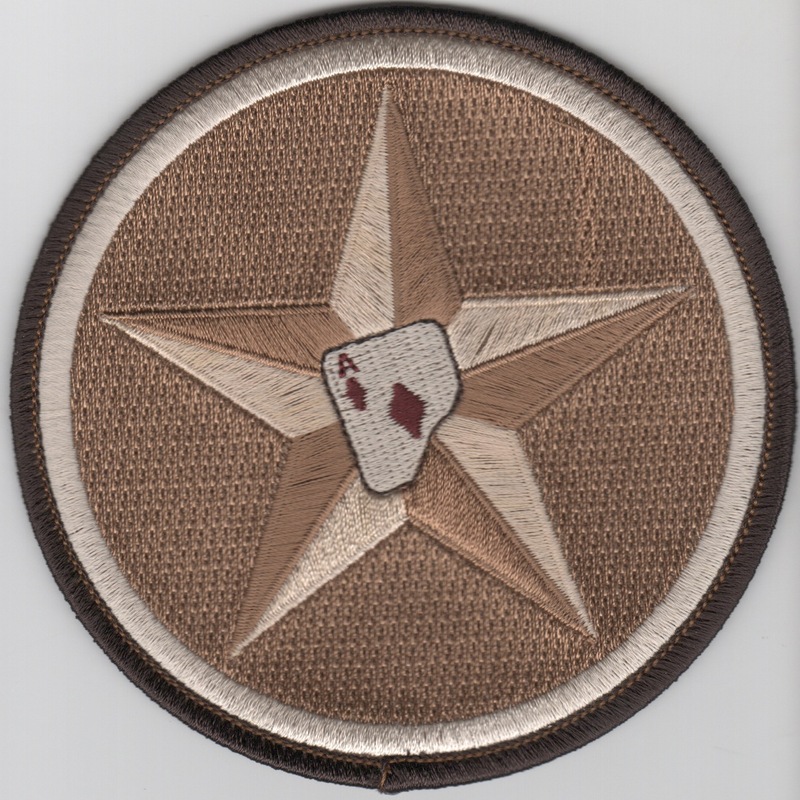 This is the desert version of the round "detachment" patch created when the "Gamblers" supported the USAF Weapons Instructor Course and/or the RED FLAG Exercises that take place at Nellis AFB, NV....just north of Las Vegas!! Their Squadron "Callsign" is "Gamblers" and shows the sideview of the Falcon head. You can read about their history above. This patch DOES come with velcro attached. 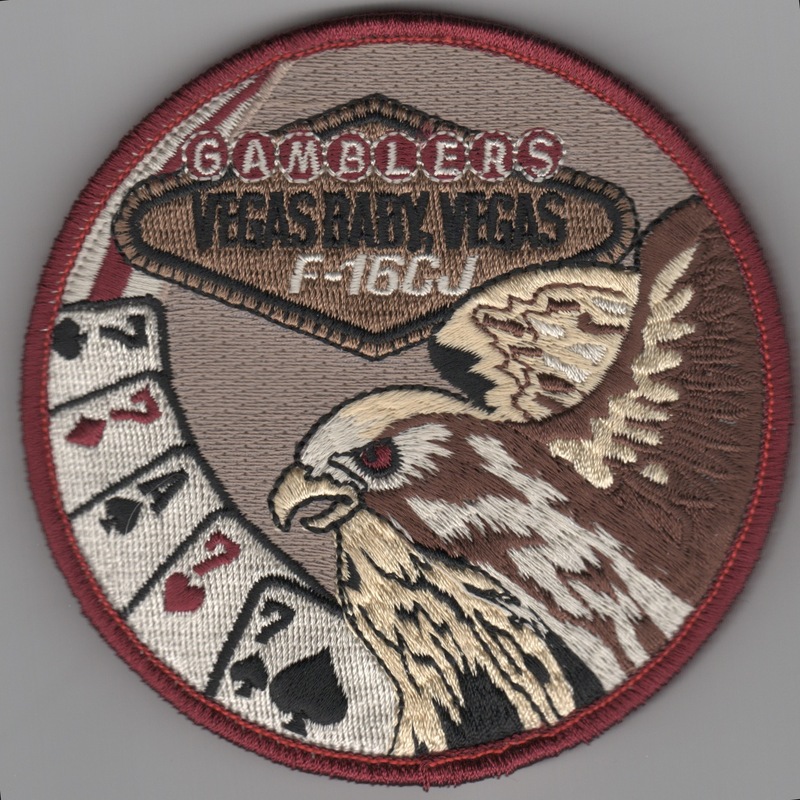 This is the color version of the round "detachment" patch created when the "Gamblers" supported the USAF Weapons Instructor Course and/or the RED FLAG Exercises that take place at Nellis AFB, NV....just north of Las Vegas!! Their Squadron "Callsign" is "Gamblers" and shows the sideview of the Falcon head. You can read about their history above. 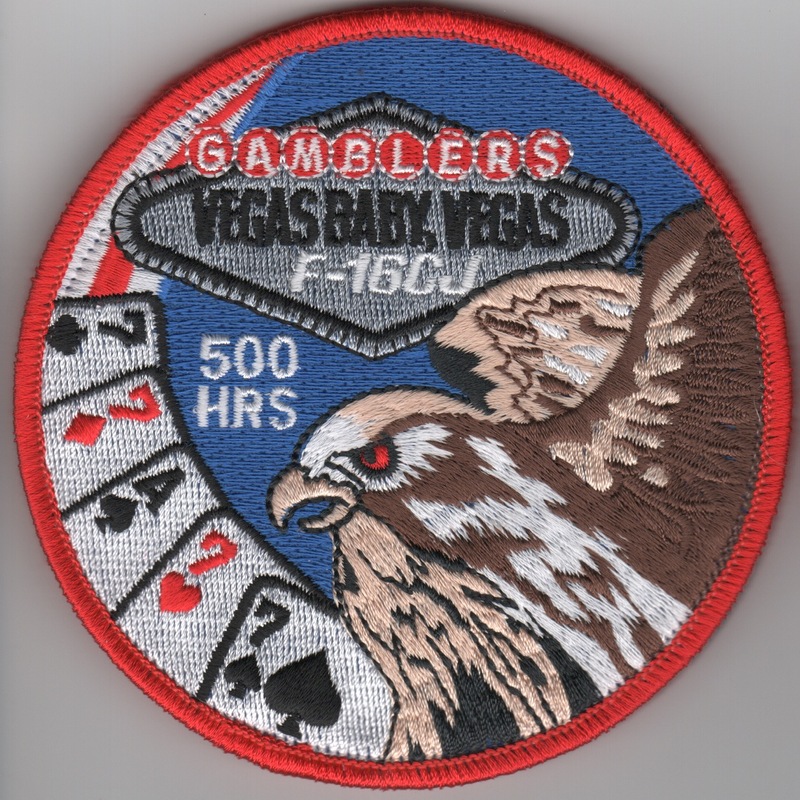 This is the patch created for those who have 500+ hours in the "Fighting Falcon" supporting tactical training requirements out there! This patch DOES come with velcro attached. 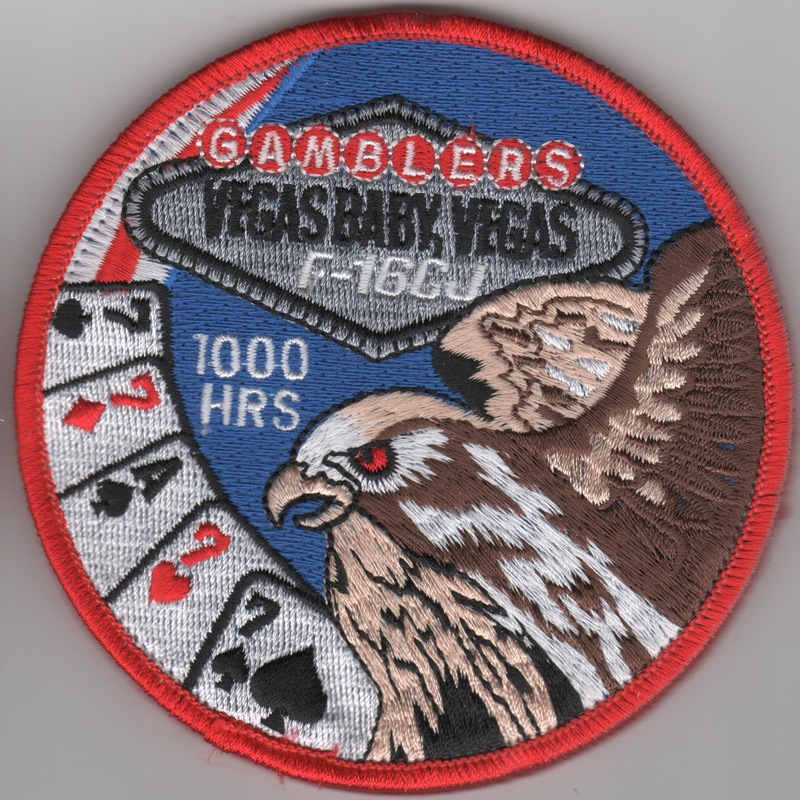 This is the color version of the round "detachment" patch created when the "Gamblers" supported the USAF Weapons Instructor Course and/or the RED FLAG Exercises that take place at Nellis AFB, NV....just north of Las Vegas!! Their Squadron "Callsign" is "Gamblers" and shows the sideview of the Falcon head. You can read about their history above. 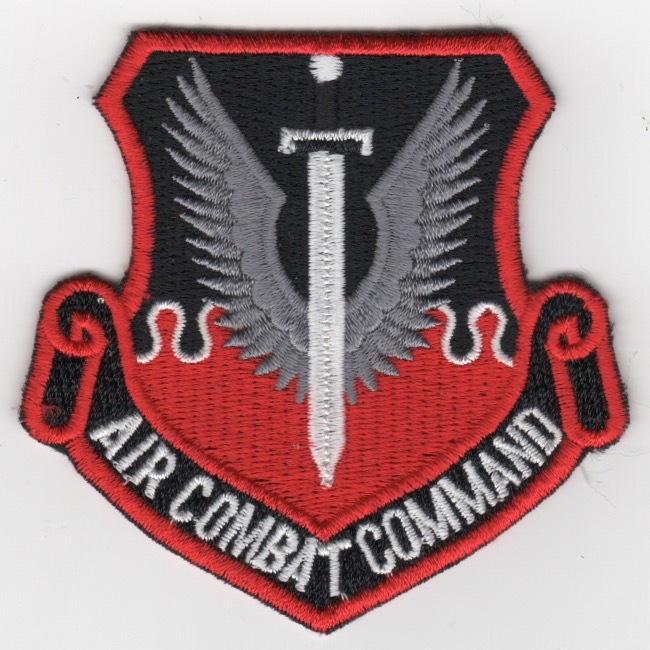 This is the patch created for those who have 1000+ hours in the "Fighting Falcon" supporting tactical training requirements out there! This patch DOES come with velcro attached. 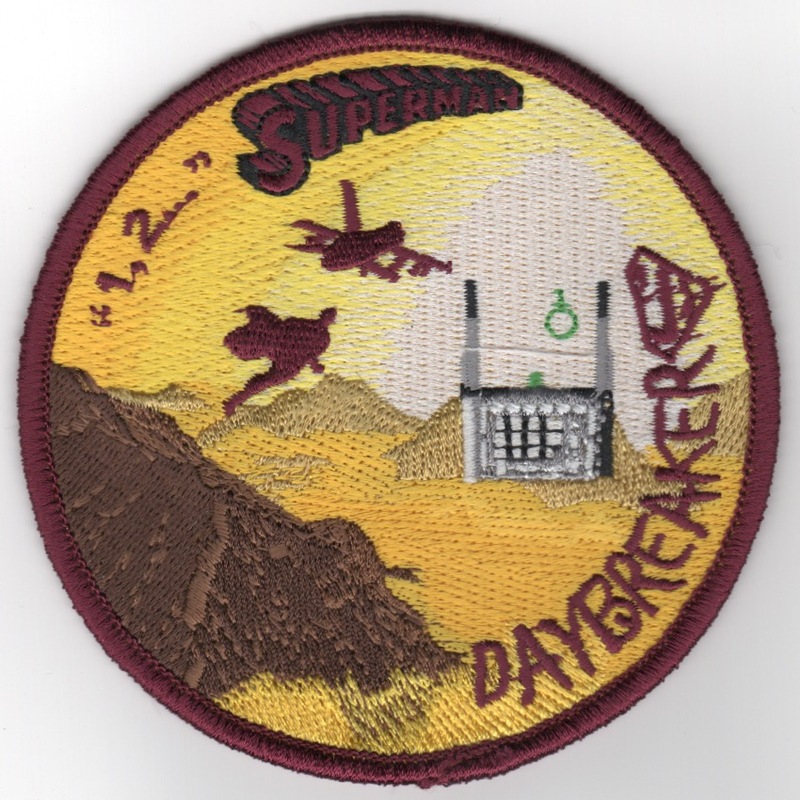 This is the desert version of the Operation Northern Watch patch for the 77th Fighter Squadron stationed at Shaw AFB, SC. This patch DOES NOT come with velcro attached. Airmen and F-16 Fighting Falcons from the 77th Expeditionary Fighter Squadron (77EFS) deployed to Bagram Airfield, Afghanistan, in support of combat operations in Afghanistan Oct. 26, 2017. Deployed out of the 20th Fighter Wing, Shaw Air Force Base, South Carolina, �The Gamblers� have an illustrious history of combating oppression and terrorism; from World War II, when they flew as a P-51 Mustang unit escorting heavies, to Operation Unified Protector in 2011, where they enforced the no-fly zone and provided protection to Libyan civilians. This patch DOES NOT come with velcro attached.